The Bosch HDH361-01 36 V Brute Tough 1/2 In. 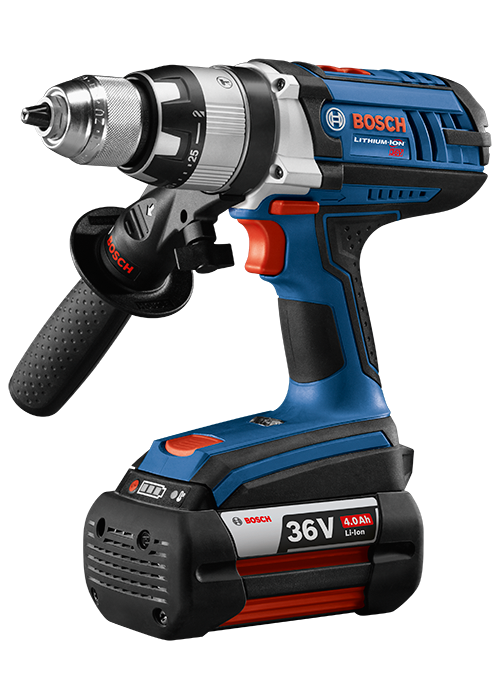 Hammer Drill/Driver features a tool with corded-like power and long battery runtime, plus two 36 V batteries and a 36 V charger. The HDH361 hammer drill tackles tough jobs, on concrete or metal, anywhere on a worksite. It has KickBack Control, an electronic sensor to reduce the hazard of sudden tool reactions in binding conditions. Its precision clutch has 25+1 settings for reduced overtightening, an upgraded all-metal chuck, and a powerful four-pole brushed motor. It produces up to 885 In.-Lbs. of torque and a no-load BPM of 0-27,000. This variable-speed drill provides high-power (0-420 RPM) or high-speed (0-1,800 RPM) settings. The drill features Electronic Motor and Cell Protection, an LED light, a side-assist handle and an ergonomic soft-grip zone. The kit features two 36 V 4.0 Ah FatPack batteries for long runtime and a 18 V-36 V dual charger.